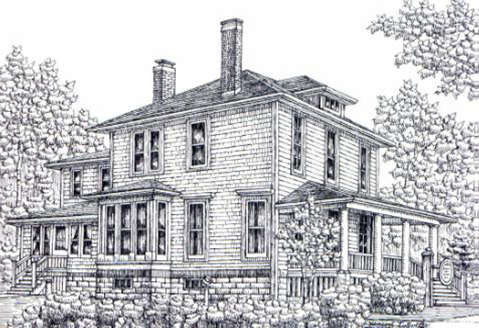 The Vial House, built in 1874 by Samuel Vial, was purchased in the mid 1980’s by the La Grange Area Historical Society. Open to the public, it is used as a museum and a research center. Samuel Vial married Margaret McNaughton. After her death, he married the widowed Mrs. Gertrude North. After retiring from farming in 1874, Samuel built a home at the northwest corner of Fifth Avenue (La Grange Road) and 47th Street after obtaining a land grant from President Martin Van Buren in 1834. Inside the Vial House, the main floor is used to display special exhibits many of which highlight the Society’s collection of period costumes that museum experts have rated as outstanding. The second floor is used by the Archive and Research Committee for files, records, and storage. A letter from Caroline Gifford dated April 3, 1972 invited civic-minded individuals to attend a meeting at the La Grange Public Library. Members of the Heritage and Architectural Commission had drawn up plans for forming an historical society. They envisioned a society whose primary objectives would include preserving the cultural heritage of the La Grange area. Since its inception on April 15, 1972 the La Grange Area Historical Society has functioned as an all volunteer organization. Financial support is provided through membership dues and donations. Additional funds are raised at programs and from the museum shop. LGAHS is a 501(C)3 organization. Our primary goal is to make the collection relevant and accessible to present and future generations. Collections of photographs, Sanborn maps and newspaper clippings have been obtained or donated to help us build a rich historical record of our two villages. Since its founding in 1972, LGAHS has been collecting documents, photos, artifacts and memorabilia significant to La Grange and La Grange Park from sources and publications dating back to the early 1900’s. LGAHS continues to archive and record information about the people, homes, schools, churches and businesses in the La Grange area. To bring together people interested in the history of the La Grange area, to provide a means and facility for study, to disseminate information, to operate an archive and museum. The La Grange Area Historical Society wants you! Learn about our latest Volunteer Opportunities or become a Member.